From the brown and mottled to the clean and gray, you either love gulls or you don't. 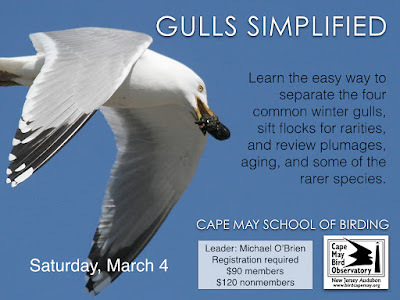 Whatever camp you're in, join Michael O'Brien on this fun Cape May School of Birding Workshop. You'll spend the morning in the field learning the easy way to separate the four common winter gulls and sifting flocks of gulls for something rare - perhaps an Iceland Gull or other species. We'll also cut through the fancy terminology around age and molt. After lunch, we'll head indoors for a review of gull plumages, aging, and rarer species. We now have online registration available through our website for all our preregistration programs, including the School of Birding workshops - CMBO Program Registration. You may also reserve your spot by calling the Program Registrar at (609) 400-3864 or by email at cmboregistrar@njaudubon.org. 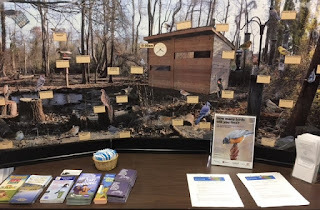 New Jersey Audubon and Cape May Bird Observatory members receive a 25% savings on all preregistration programs. 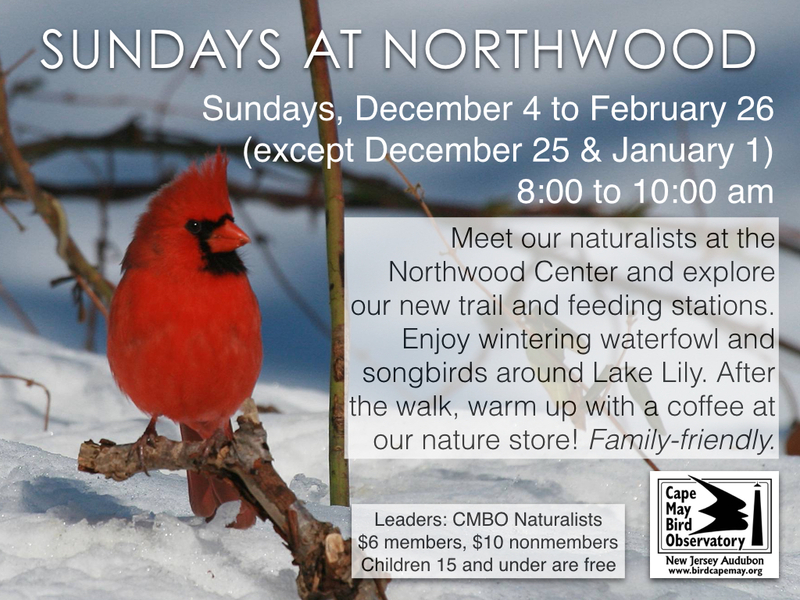 Join us for a special, free, family-friendly event this weekend at the Northwood Center in Cape May Point, in celebration of the Great Backyard Bird Count. With your help, we will conduct hourly counts of the many different types of birds at our feeders and surrounding habitat, with walks along the Ryan De Witt Memorial Path led by our Associate Naturalists. Learn how to identify and attract birds t...o your home. Hourly counts/walks will be held at 10:00, 11:00, 1:00, 2:00, & 3:00, with the data being posted on a tally board in the center and entered into the national database. Join in the fun and help us enjoy the beauty of backyard birds!! 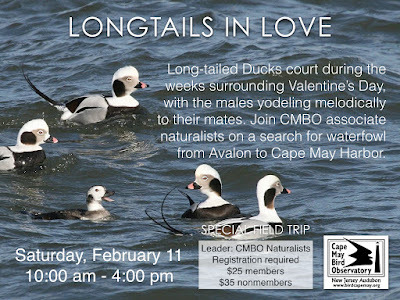 Coming Up: Register today for Longtails in Love! 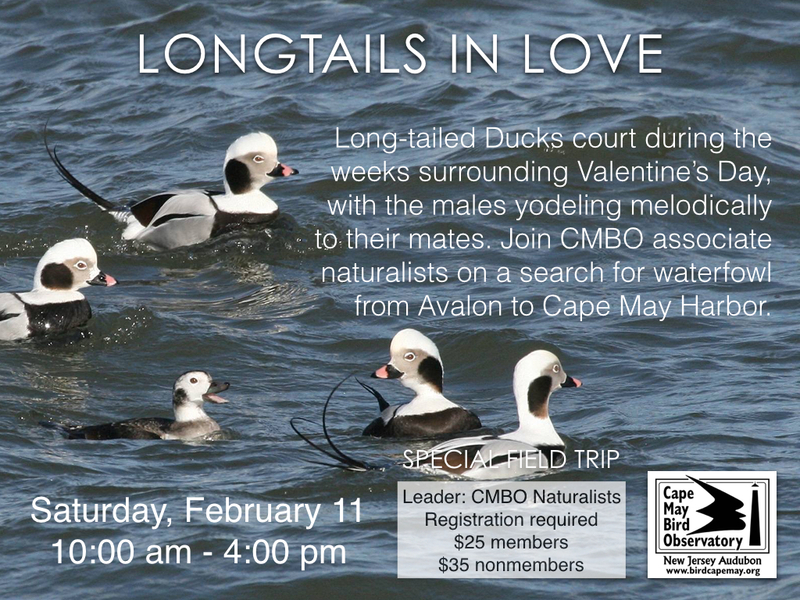 Join Chuck and Mary Jane Slugg and other CMBO Naturalists tomorrow for their annual "Longtails in Love" outing for up close looks at Longtail Ducks, scoters, mergansers, and other waterfowl along the barrier islands of Cape May County. Call 609-400-3864 by 4 pm today register for tomorrow's event! And, if you're up early on Sunday, join us at the Northwood Center on Lake Lily in Cape May Point. No need to register for this walk. 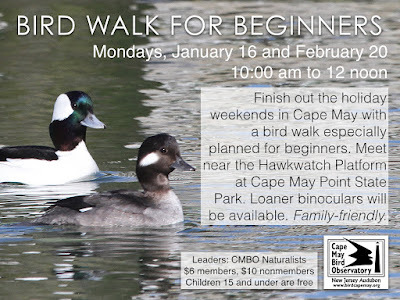 Finish off the long weekend by coming on our Bird Walk for Beginners on Monday at 10 am at Cape May Point State Park (meet near the Hawkwatch Platform). No need to register for this walk.